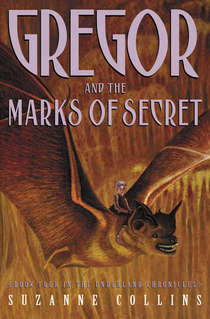 Gregor and the Marks of Secret was written by Suzanne Collins. It is book 4 of 5 in The Underland Chronicles. No good deed goes unpunished in the fourth installment in the popular series. Gregor and his sister Boots are regular visitors to Underland, where their mother is slowly recovering from injuries incurred in the previous episode. Gregor is supposed to be studying echolocation with his rat friend, Ripred the Gnawer, but hes doing very badly. Ripred has his own problems, largest of which is Bane, the once-sweet little baby Gnawer whom the protagonist refused to kill in Gregor and the Prophecy of Bane (Scholastic, 2004). Bane, now a half-grown monster of a rat, is surprisingly charismatic yet emotionally stunted and easily controlled by the forces of evil. When Queen Luxa gets a message that the mice that saved her life in the jungle are in trouble, she and Gregor head out to investigate, accompanied by her cousin Howard, several bats, Gregors sisters, and a brave cockroach named Temp. The breathless pace, intense drama, and extraordinary challenges will leave fans clamoring for the conclusion of this fine series. Another exciting installment in the series. I love that the stories just keep moving. Lots of action and quick thinking.